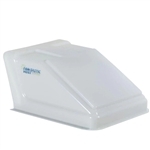 Does the U1500WH vent cover have a grill with it? It shows it on picture as well as listed on the instructions. Does the Ultra Breeze RV vent cover come in black or smoked color? The vent opens higher than the Ultra Breeze vent cover, is that an issue with the motor on the fan? Will this cover allow an airxcel roof vent with rain sensor to open all the way without hitting the ultra breeze? I have found differing dimensions, particularly re the height from your 9.5", to 10.2" and 11". What is correct? Does the 31-2020 attach directly to the roof or to the existing vent structure via clips?